Translucent garnet in color. A floral, violet-driven nose with bright red fruit, dried leaves, and an essence of green cuttings. On the palate: delightful cherry and young raspberry on the fruit profile, together with an excellent acidity and chewy tannins; rounded out with notes of earth, clove, cumin, cinnamon, oak, and slate. Unlike many Montepulcianos I have tasted, this one is in great shape to drink young but has enough acidity and fruit to age for a decade or two, when this wine would go from really good to possibly stunning- if you can bear to keep it that long. Made from 100% Nero grapes, this is a wine to please your wine-loving friends and make their mouths water. I paired this wine with a pot roast and was thrilled at the result, a very complementary set of flavors for the roast and the winter vegetables. But unlike most wines, I couldn’t stop pouring myself another one-0unce taste over and over again, as my nose went back again for the violet aromas that filled the top of my palate, even as I enjoyed the wine with meringues for dessert instead of coffee or tea. This is a wine that won’t allow me to taste it over a week with at least three proteins, because it isn’t going to last that long. Hello, time to order a case? This wine has made me more interested in the Nero grape (since it was a new expression of the grape to me), as well as the wine importer/retailer/wholesaler Topochines Vino, whose selections are intriguing, reasonably priced, and made me raise an eyebrow and want to order several bottles as soon as I began to browse their online store. A clear win, and worth checking out. Why don’t we drink moscato d’asti all summer long? It’s a good question. We should! On a brutally hot day, sometimes the best thing you can do is pop open a bottle of Moscato d’Asti. The gentle effervescence and delicate fruit provides a lovely respite from the hot sun. In the past I mistakenly viewed moscato d’asti as a dessert wine, but a recent Master Class tasting clearly demonstrated to me where the strength lies with these delightful, low alcohol, and inexpensive wines. Here’s the thing about moscato d’asti it offers light acidity, low alcohol, and crisp, clean ripe fruit flavors with floral and herbal aromas. Because fermentation is halted early, sugars that would normally convert into alcohol are left behind in the juice (literally). So the wine is a touch sweeter than a dry riesling, for example, but also has the benefit of being bubbly, another natural occurrence from the fermentation in closed steel tanks. I have to admit, I made a mistake in seeing Moscato d’Asti as a dessert wine. At this tasting, I noticed the best pairing came from the wine’s natural complement to savory flavors of cheese, quiche, bread, and mortadella. It left the mouth fresh, lively, renewed. When paired with petit fours, the experience was simply too much sugar at once. But against a savory bite? Perfection! And on a hot day, these wines were refreshing and delightful on the palate, a good way to escape the midday sun. Gorgeous setting, but a sweet bite was not the finest pairing for Moscato d’Asti. I preferred savory! A lovely lineup of six Moscato D’Asti wines, all quality, well-made wines from 2015, under $20. Saracco Moscato D’Asti DOP 2015: ABV 5.5%, WS Average $15. Color is very pale with hints of straw. The nose shows apricot, white pear, and orange peel. On the palate a medium effervescence is met by tangerine and ripe peach. Sugars are direct and upfront. La Caudrina Moscato D’Asti DOCG 2015: ABV 5.5%, WS Average $15. Color is pale straw, nose is decidedly floral with a hint of herbs. On the palate, crisp pear, honeysuckle, and orange peel are evident. Sugars are back palate. Vignaioli Di Santo Stefano- Ceretto Moscato D’Asti DOCG 2015: ABV 5,5%, WS Average $17. Medium straw/goldenrod in color. The nose is subtle with herbs & fruit. Sage, lavender, and white peach. On the palate, light effervescence, dried apricot, golden delicious apple. Sugars are in the mid & side palates. Impressive balance. Coppo SRL Moncalvina Moscato D’Asti DOCG 2015: ABV 4.65%, WS Average $15. Color is pale straw with a green tinge, the nose is sweet with wildflowers, peach and apricot. In the mouth, baked peach, ripe apple and orange blossoms up front. Sugars are direct and forward in the mouth. This wine fits right into middle, as the median of the six wines tasted. Michele Chiarlo Nivole Moscato D’Asti DOCG 2015: ABV 5%, WS Average $20. Color is pale straw, the nose shows citrus, honeyed apricot, and distinct notes of sage and thyme. Light effervescence with tiny bubbles. Fruit is quite delicate in the mouth. A less sweet approach, with gentle apricot and peach, sugars faded to the side palate. Very nice. Marenco Vini Scrapona Moscato D’Asti DOCG 2015; ABV 5.5%, WS Average $19. Pale yellow in color. Nose is most delicate of the wines today: lightly herbaceous with orange blossom. Delicate flavor profile of orange, lime, apricot and peach. Sugars and citrus are firmly in the back palate. I enjoyed all of these wines, but personally my favorites were wines #3 and #5 in our tasting (from left to right in the pictures of the glasses): the Vignaioli Di Santo Stefano-Ceretto (the bottle with the elongated neck) and the Michele Chiarlo “Nivole”, both of which had distinct fruit, floral and herbal notes, and sugars that were less noticeable, placed on the side palate. If you aren’t already a fan, I suggest you try Moscato d’Asti soon, and enjoy it in the afternoon as a refreshing complement to a savory bite. You will be pleasantly surprised how well it pairs with meat or cheese, how beautifully it blends with creamy flavors, and how the herbs in the wine will pop in harmony with arugula or fresh herbs in a dish. Needless to say, both the bruschetta and all three wines were hits! I decanted the Tuscan 2000 Brunello sangiovese and although it showed a hint of browning on the edges this wine is a stunner with plenty of life left to go. It has the most muted fruit and was the most subtle of the three, but those who drank it raved and championed its delicacy, depth and balance. 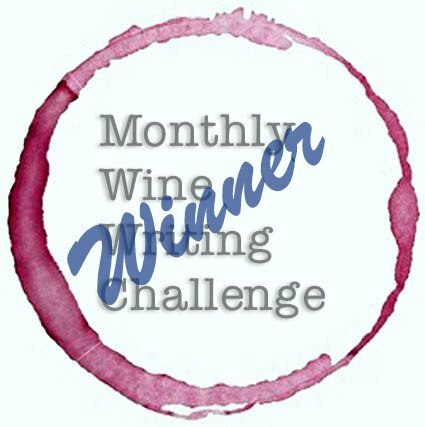 The in between wine is the Pian dell’Orini Rosso di Montalcino, which is a sangiovese from Tuscany with delicate color, vibrant nose and fruit, and good balance of acidity. 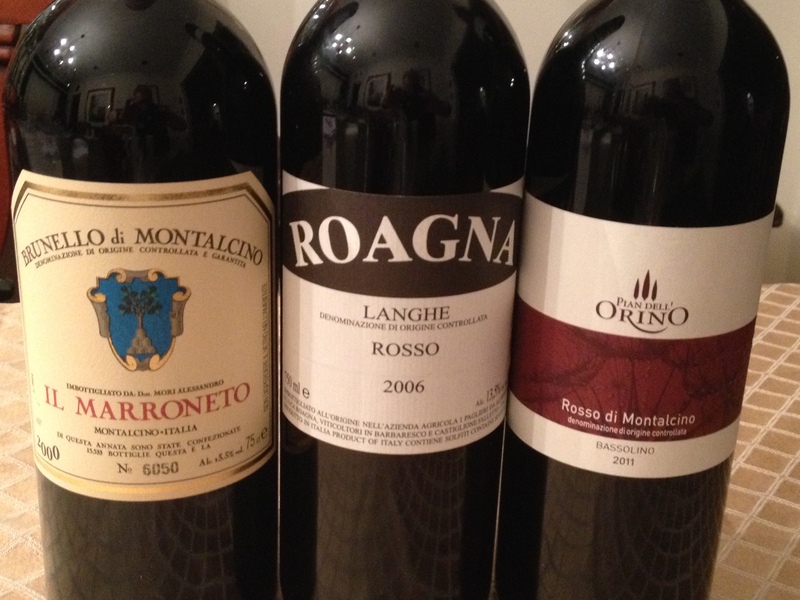 Rosso di Montalcino is the baby brother to Brunello, and even in a listed off-year, shows magnificent value. This wine compares well to Burgundy pinot noir, not shocking given that both Tuscany and Burgundy are on the 43rd parallel with similar topography. The Langhe Rosso, a delightful nebbiolo from Piedmont, had the darkest color, fullest nose, and the most body of the three wines. While they all were made by different producers, many guests who tasted the range suspected a vertical and either a name-changing winery, or neighboring vineyards. Nope, these three wines demonstrate wonderful Italian winemaking, plain and simple. They worked wonders with the vegetarian chili as well as pizza, baked ziti, and the various appetizers that were served. For the wine drinkers, the choices were an obvious Super Bowl win. What did you drink for the Superbowl this year?